From iconic stores to malls and popular street bazaars, Hyderabad has a great shopping scene. Across the city, there are several places where tourists and locals can spend the entire day shopping. While big branded stores and malls are a great way to beat the summer heat, the street markets and bazaars have their own unique charm. Whether you like shopping at a mall, a branded store or on the streets, you will have a great experience shopping in Hyderabad. Let us in this article take a look at the 15 most popular shopping places in Hyderabad. This bazaar is one of the oldest shopping streets in Hyderabad. The best time to visit is on a Thursday when the weekly flea market is held. At this flea market it is best to buy old and antique items. The stalls here sell very good old furniture, home décor items and even kitchen and home tools at throw away prices. There are a few shops that sell cricket gear and junk jewellery too. 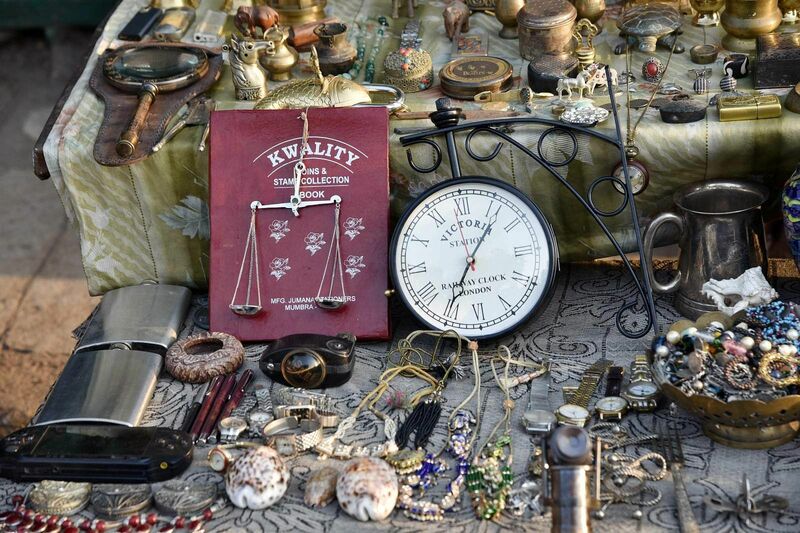 The flea market is held every Thursday from 9 am onwards. The Laad Bazaar has been in existence for over 100 years ago. It is located close to the Charminar on one of the four lanes that branches out from the historic monument. At the Laad Bazaar, you get bangles and other accessories at reasonable prices. Go during the festive season to find a huge selection of bangles in different designs and prints. Shops at Laad Bazaar open from 11 am onwards. Located in a crowded bylane, the Shahran Market is famous for ladies clothing. Although there are shops that sell salwars and other style of women’s wear, the market is famous for burqas. In fact, inside the market is a manufacturing unit that makes export quality burqas. If you are shopping here and are hungry, stop over at the Shahran hotel for yummy Haleem. Abids Street is one of the splendid places to shop in Hyderabad. There is so much to buy here, you will not know where to start. Electronics, handicrafts, art, clothing and species are only a few items that can be found at this street bazaar. The place is also famous for sarees. So, the next time you plan on shopping at Abids, do not forget to get a traditional Indian saree. The market opens from 9 am onwards. 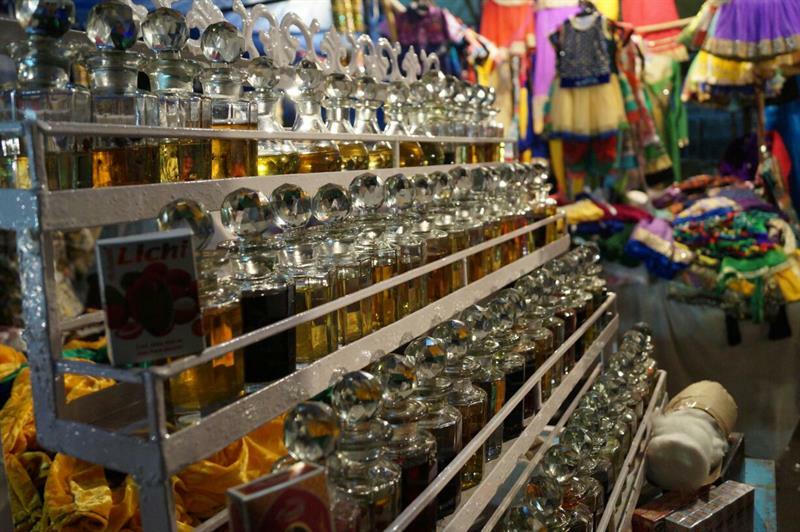 This is Hyderabad’s only market dedicated to perfumes. Located close to Mir Chowk, you can get yourself a variety of rare and unique perfumes stored in gorgeous glass bottles here. The Begum Bazaar is a must visit for anyone that loves Indian wear. At this buzzing market, you can shop for Indian wear, bangles, spices, junk jewellery and accessories at throw-away prices. For a true street shopping shopping experience, visit on a weekend. The Moazzam Jahi Market is mainly a fruit market in Hyderabad, but you’ll also find clothing, accessories, spices, fresh flowers and even groceries here. The Moazzam Jahi Market is also a wholesale bazaar for hookah and ittar. 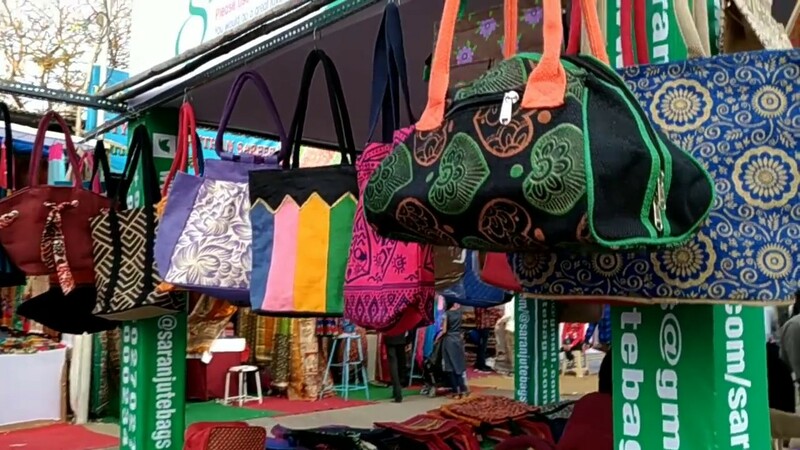 If you are looking to shop for a diverse range of products, the Nampally Market is the place to be. The market is famous for its annual exhibition Numisha that is held in January and February. If you are looking to grab a bite, post shopping, in the market, there are a few restaurants that serve delicious Hyderabadi food. The pot market in Hyderabad is a famous jewellery market where you can shop for necklaces, bracelets, chains and earring. It sells a variety of artificial as well a pure jewellery with excellent, modern designs. At the end of the market are a few garment and vegetable shops. For a real street shopping experience in Hyderabad, visit the Koti Sultan Bazaar. The bazaar is always crowded, with shoppers trying to get good deals on products they buy. At the bazaar, browse through the latest in Indian wear, accessories, and bangles at very good prices. On the street, you will find a few vendors selling homeware and street food, too. The Antique Market is the place to be for anyone looking to get themselves a few antiques. At this market, everything from spare parts to clocks, furniture and even house décor items are available. When you visit, do bring your best bargaining skills to get yourself a good deal. Since the products are old, make sure you check them thoroughly before buying. Hyderabad Central is a one-stop shop for all things clothing. The mall is home to the best high-fashion brands in India and caters to kids, women and men. They also sell accessories, perfumes and travel gear. Watch out for the great offers the mall has during festivals. The Inorbit Shopping Malls in Hyderabad is a great place to spend the weekend or an evening. The mall has some of the best retail brands that are a mix of trendy high-fashion to luxe. Apart from shopping, the mall offers a variety of entertainment experiences: there is a gaming zone, a cinema hall and an artificial football turf. Those looking to rejuvenate and relax can head to the spa and salon that is located in the mall. The GVK mall has a plethora of retail stores that stock the latest in fashion and accessories. There’s also a huge food court, a couple of pubs and restaurants, a cinema hall and a fun zone with amazing games for the kids. A sprawling mall in Kukatpally, go here to shop for the latest in fashion and accessories. The malls is home to some of the best brands in the world and offers you a complete shopping experience. It’s also equipped with free WiFi, a prayer room, disabled access, prepaid auto and taxi facilities and a baby care room. Hyderabad is famous for its shopping experiences. And with out list, we hope you know exactly where to go to find what you’re looking for. If you think we missed out on a few places or know about some cool places to shop, we would be happy to hear from you in the comments section below.